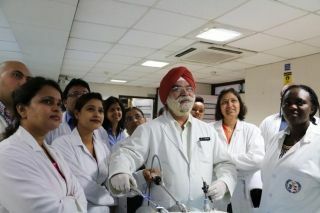 Surgeon and Gynecologist performing Laparoscopic small bowel resection and anastomosis demonstrated by Dr J S Chowhan. Today the doctors were given training in laparoscopic Anastomosis tecniques. For small diameter structures like Fallopian tube, ureter, CBD etc only hand sewn anastmosis is possible. Endo GI staplers are used for small and large bowel. The doctors were told that the principles of anastmosis are same both in open and laparoscopic surgery. The doctors practiced this on a model and the suture line was in the same horizontal plane as the needle. This made their task difficult and it gave them good practice in needle alignment.